Sr. Cloud Developer Advocate focusing on IoT, OSS, Containers, and Kubernetes. Paul stumbled into computer programming at a young age, starting with a pair of Tandy TRS-80s and Basic manuals pulled out of a neighbor's garbage. In 2006, he completed a Bachelors in Psychology with a Minor in Business at the University of Houston, then, two years later, returned to complete a Masters in Computer Science, and came back yet again to earn the title of “highest rated professor at UH” according to RateMyProfessor.com. 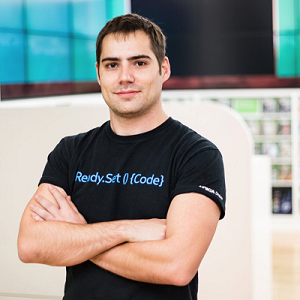 He has spent the last five years working for Microsoft in Developer Evangelist and Software Engineering roles and considers them the best years of his life so far. His technology interests are across the board, with a special gravity towards IoT related things. He loves making old things new again through self-prescribed technical exercises, having recently placed an order for Starbucks coffee from a Commodore 128 in C64 mode. He keeps a steady supply of video games on tap upstairs, provided by sixteen retro game consoles connected via A/V switch to a 29’ Sony Trinitron CRT television and has been known to perform as lead vocalist in Houston's Tool Tribute Band - Spiral Out. During time off, he enjoys taking care of his thirteen trees, riding mountain bikes, and walking his Shi Tzu - Romeo.